When Lung Ying-Tai – the outspoken writer who is now Taiwan’s first Culture Minister– arrived for a talk in London last month, she was met with the kind of reception usually reserved for rock stars. Mobile-phone cameras aloft, unabashedly star-struck fans packed a standing-room-only lecture hall at the School of Oriental and African Studies to hear her speak with refreshing candour about her new position. “Are you here because I’m a writer, or a minister,” she playfully asked the crowd at one point, “or despite the fact that I’m a minister?" Indeed, Lung Ying-Tai is no ordinary bureaucrat. The author of several works of social criticism, the Taiwanese writer is celebrated in China, Singapore and Taiwan as robust defender of media freedom. 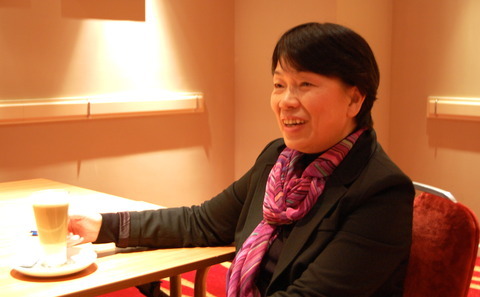 After a four-year stint in Taipei city government under then-Mayor Ma Ying-jeou, she was appointed in 2012 to head Taiwan’s new Ministry of Culture – Taiwan’s first new ministry since 1949.
chinadialogue’s Isabel Hilton and Corinne Purtill spoke to Lung Ying-Tai in London during her visit to Europe last month. chinadialogue: We read that Chinese culture conserves nature, but reality often paints a different picture. What is the role of nature in culture? Lung Ying-Tai: I was in Paris a couple days ago. Paris, as you know, is a grand city. Going inside and outside any of those buildings, everywhere you see the prominence of human faces and human figures, which is absolutely not the case at all in China. In typical Chinese landscape paintings, the mountains are huge and the people are small. Within the refined, educated class, there is a dominant philosophy – the Chinese philosophy – where mankind is considered only a small part of nature. From there developed the theory that you live in harmony with nature and you do not conquer nature. From that logic, the Chinese also say, ‘That is why we did not develop real imperialism like the West did. We did not go out to conquer’. Which I think is also true. However, when we go to today’s China, you see the opposite. That is, you try to exploit, you try to get economic gains – which is the priority – at the cost of nature, and there are disastrous consequences. There are very, very serious problems with water, with pollution. So are you saying there’s a huge conflict between the philosophy and the actual practise, where the economic gain overrides every other concern? I don’t know how to answer this. CD: Taiwan obviously had its industrial revolution earlier than the mainland and has moved into a more advanced technological economy. Does that allow a return to traditional concerns about nature in a way that we have not yet seen in the mainland? LYT: I think it’s really complicated. Taiwan, indeed, ‘thanks’ (quote-unquote) to colonialism entered the age of modernity earlier than most parts of China, because of what the Japanese did. I remember in the ‘70s, every day on my way to school I would go past a village. Every day, when our bus would pass that village a very offensive odour would catch us. Only later we learned that people who collected cables as waste would bring all the cables to the riverside there and burn them there to extract the copper. Over years, dioxin collected there. Statistics showed that village produced the highest number of babies born without brains, or with brain damage. So Taiwan also went through that period which China was going through and is still going through now, at a huge scale. Look at Mao Zedong in 1949, looking from Tiananmen over the beautiful city of Beijing. He said, ‘We must bypass the US and the UK, so let 10,000 chimneys rise’. That was the mindset, and that was considered progress. When you define progress as such, nature has to give in. If you’re lucky, before you ruin everything, new technology saves that path of destruction. That awareness I think China now also has. However, there’s a huge discrepancy between the speed of rescuing and the speed of destroying. CD: Do you think that individual artists, writers and intellectuals can help that process along? What is their role in explaining society to itself, and the consequences of what society does? LYT: The essential privilege of an artist or a writer is that he or she makes what is not visible, visible. That is the essential task of creative people. With environmental destruction, when an artist shows you pictures of it or a writer writes something about it, it naturally raises people’s consciousness and awareness much more than what the government or journalists try to do. Artists are seers. They see what people do not see, and they express in a way that people get to see through their artistic means. CD: What are the conditions necessary for the artist or writer to be able to do that? LYT: Freedom of expression is the floor you stand on. In a society that is not free, talented minds waste a lot of their time and energy on things that are not really essential. The writers are trying to figure out how they can say what they’re not allowed to say. Eighty percent of creativity and energy goes into figuring out how. You’ve got only 20 percent left to really go deep on the essence of things. And to make it worse, the readers spend a lot of time enjoying the game, looking for secret codes, exchanging information on how to interpret things. In other words, the collective creative mind is channelled on how to waste your life, leaving the essential things untouched. CD: How is your voice as a writer changing? LYT: It changes a lot. The test case is my voice about China. As a writer, what I wrote represented only me. But as a minister, anything I say represents not just myself, but the country. I have huge responsibilities. And of course I have priorities, and I will probably have to compromise on certain issues in order to achieve the major goal. It’s a totally different picture from being a writer. CD: Do you get to write much now? LYT: No, not at all. I hardly have time to sleep. CD: If you look at biodiversity in ecosystems, the loss of a tiny, perhaps unconsidered species can have enormous consequences because we don’t realise how the presence of one species supports the survival of others. What’s the role of diversity in a healthy cultural ecosystem? LYT: This is what I try tell the Western world about the importance of Taiwan: Imagine the world map without this vibrant Taiwan. How would you imagine what China is, or could be? You have that one big China as the only point of reference. So Taiwan itself, on this larger scale, is that diversity piece which cannot be missed. It’s essential. Then within Taiwan, one out of every eight kids born there today has a foreign mother or father. For most of them, the foreign parent comes from mainland China or Southeast Asia. If we do not fully recognise that these children of foreign origin – and probably from cultures which the majority of the local population used to look down upon – are an essential piece in the mosaic of Taiwan for diversity, for vitality, for sustainability, then you are done for. Taiwan is finished. CD: Would that apply to the mainland also? LYT: Very much so. There are too many such pieces in the mainland which are not recognised as essential. CD: What are you optimistic about in your current role? LYT: Almost every single step I, or my ministry, or the government takes – it’s like being in the centre of the arena, with greater China watching. We make mistakes, yet we know there is a historical significance to almost every step we take. When I stand up against something, I know our Chinese intellectuals are watching, and they are trying to understand why you are doing this, and saying this. Within greater China, you are in this arena where you are small and weak in some aspects, and yet you know you have a historical task. CD: Are we going to see a novel about politics eventually? LYT: (Laughing) When I’m frustrated in Parliament, I always want to say, ‘I’m going to put you in my Chapter 8!’ But I can’t say that. Sam Geall finds Judith Shapiro's new book on China's environmental challenges to be a work of exceptional clarity and depth. A final journey on the Jinsha River brings a mixed group of travellers back to nature.